Combining hub pages for key topics and keywords with well-planned internal linking can be a very effective SEO strategy. It helps to ensure that, when you are creating content around a topic regularly, that you can rank consistently for the relevant keywords. I’m going to use examples from Mail Online which, by some accounts, is the most visited English-language newspaper site on the web. That doesn’t mean it’s the best – far from it – but it does provide a useful subject for this post. Mail Online recently started using hub pages on a consistent basis for many of its most popular topics, though not for all. This gives us an opportunity to see what effect this has had. So here I’ll look at the strategy for two topics, and an example of what happens when you don’t do this. Hub pages: what are they and why do you need them? In this context, a hub page is a page themed around a certain topic or keyword. It could be a tag page, like this for SEO, or perhaps a category page. Sites which produce a lot of content around the same topic often end up competing with themselves for search positions. This is especially true with news articles, as in the New York Times example here. News articles are generally brief and will come and go in the search rankings. However, linking them to a hub page helps signal to Google that this is the page that should rank for a particular keyword or term. To demonstrate how this works, here are some examples from Mail Online. Mail Online had no hub page strategy of any kind until recently. Dan Barker (@danbarker on Twitter) pointed this out recently, and estimates that Mail started this strategy around October 25 last year. This means we can get a before and after picture looking at the effects of this tactic. Here, we have the search results for the entire Daily Mail domain for the search term ‘Chelsea News’. This is news related to Chelsea football club, a relatively popular search in the UK. We can see that it started returning results for this hub page from November 7. It has also implemented pages for other English football teams. This page has existed before, though its search performance was inconsistent until November 7 last year. This chart shows the rankings for that page, and we can see a consistent (and higher) search ranking from November onwards. The difference is the internal linking strategy. The article screenshot below (article is from May 2015) shows the opportunities to link to the hub page which were missed. This next screenshot shows the new strategy. In this article from December 2015, links lead back to the Chelsea team page (the hub page). This is the Daily Mail team page. As well as internally linking from each article the site is now using the different elements on the page. For example, team logos and live tables are now linking back to the individual team landing pages. Like the previous example, the rankings are inconsistent and many different pages are returned by Google for the term in the six month period shown. That is until early November, when the hub page takes over. Since then, the performance of this David Cameron landing page has improved significantly. There have been a couple of blips since November, perhaps due to inconsistent implementation of the linking strategy, but the page is performing much more effectively. Again, the difference is between using internal linking effectively, and missing the chance to link, as shown in this article from August 2015. Now, the Mail Online’s editors have learned to use internal links (perhaps there was some internal training back in October) and news articles and opinion pieces about Cameron all link back to the hub page. Of course, Mail Online has been slow to realise the value of internal linking (I raised this back in 2014) compared to some other news sites. 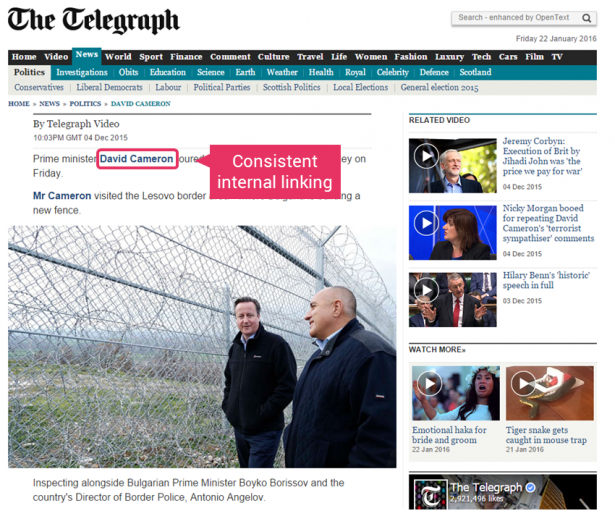 For example, The Telegraph has used linking correctly for some time, and this is reflected in the performance for its David Cameron landing page. Its hub page ranks consistently for the term because it has linked from all its Cameron articles for some time. This means that the Telegraph and The Guardian (which also knows what to do with links), are the only news sites to rank on page one of Google for the term with their landing pages. Although the Daily Mail are now internally linking and using hub pages, the site isn’t doing it for every search term (or hasn’t rolled out the strategy across all of its sections yet). This underlines the impact that effective internal linking can have, used along with dedicated hub pages. For example, celebrity news brings in lots of traffic for Mail Online, and it writes about any vague ‘news’ linked to celebrities. However, very few celebrities have landing pages as yet. For example, Jennifer Lopez. As a result, the Mail’s rankings for this search term are up and down and return 55 different URLs in the six month period shown below. As the previous examples have demonstrated, with a J-Lo landing page and the right links, the site could rank consistently and bring in even more traffic. Mail Online creates and publishes huge quantities of articles about celebrities and news. With each of these articles they gain thousands of links and social shares from their readers. While each new article performs relatively well in search, they do so for a limited time only. Ss the article becomes old, positions drop until the original article is usurped by a new article, and so on. These examples show how effective the use of linking and hub pages can be, and demonstrate its value, especially for sites that produce a lot of content around the same themes. They also demonstrate how quickly sites can achieve results with this strategy. In the Mail Online’s case, it seem to have taken Google just over a week to view the links and return the intended page for the search terms. This strategy, implemented across a range of keywords, enables sites to rank more consistently for a broad range of search terms, with obvious beneficial effects on traffic.